Dr. Tim Holcomb, of Victoria, has witnessed many changes in healthcare in three decades’ time, and what concerns him the most is that despite medical advances, people continue to get sicker and sicker. 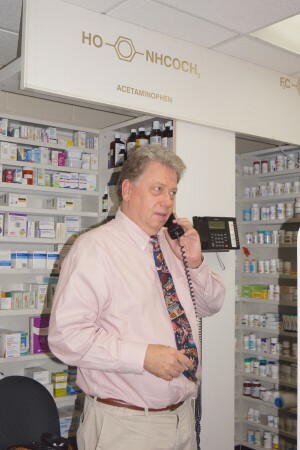 Dr. Holcomb, who is a pharmacist with Medicine Man Pharmacy, located at 1202 N. Virginia St. in Port Lavaca, has been a pharmacist for almost 30 years. He also practices chiropractic neurology and nutrition at his Neurologic Relief Center of Victoria, located at 2601 N. Azalea St.
Holcomb believes the culprit in society’s degenerating health is cellular inflammation, or when the body tries to repair cells that are not damaged. Holcomb believes cellular inflammation is caused by three factors: nutritional deficiencies, the accumulation of toxins in the body and disruption of the nervous system’s normal ability to control the body’s functions. Holcomb first became interested in medicine as a college student, when he began to suffer from fatigue and an inability to focus. His father, a dentist, recommended Holcomb take supplements. “It worked. I really believed the supplements saved my life,” Holcomb said. Shortly after, Holcomb became interested in nutrition and realized he had a desire to help people through medicine. “I wanted to figure out what makes our body work and what is the best way to help people. I have long been interested in alternative medicine. For instance, I was aware of the extreme importance of balancing a person’s body chemistry with natural nutritional means even before I became a pharmacist,” he said. His passion for learning new ways to help people prompted Holcomb to earn a degree in chiropractic neurology after pharmacy school. He has recently become certified in a new neurological treatment that helps turn around stubborn cases, Holcomb said. Also as a pharmacist and a nutritionist, Holcomb sees himself as a bridge between alternative medicine, including nutritional therapy, and standard medical care and drug therapy. Holcomb said medications, if not managed correctly, can become toxic and the side effects can interfere with one’s health. Holcomb has taken a holistic approach to medicine. He has spent years researching the interaction of the nervous system and the chemistry of the body, including the hormonal system and the immune system, and how balancing all of this helps the total person to heal. Holcomb believes this synergistic approach to health is the new frontier of medicine.